Could your classic be our next "Car of the Month"? Are you the proud owner of a classic car or art car? Every month, we put one of you, with your car. If we select your photo you'll win a shirt of your choice, plus you'll get to show off your pride and joy to the world. Just send us a photo of you (and your family, if you like!) with your car, along with a short vignette that says something special about you and your car, like the ones in our People & Cars section. We prefer to receive email with the photo as an attachment, but you can also send paper copies to us by U.S. Mail. 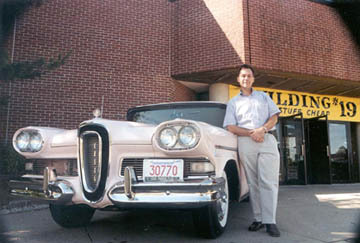 Peter LaChapelle with his 1958 Edsel in front of the Somerville Mass. building which once housed the factory where LaChapelle's Edsel was built. We've put some of our favorite classic cars on our Shirts and Prints - check them out!